I thought cats and flowers would be easy, uncomplicated and straightforward topics for pictures. I said it to Colin quite flippantly when he asked me for a title months ago. What I discovered was that painterly concerns come to the fore once the subject matter is decided, and this was good for a change. However painting them from life was difficult. Cats move all the time, even when sleeping and flowers and their leaves change how they look depending on the light. I was surprised to see that the domestic cat has shades of a cartoon. This happens when features become enlarged (in the case of the green cat) or reduced. Cats will receive almost limitless amounts of love from us. They comfort us and demand attention for food and company. They like to dictate to their carers. They lead a life apart from us, often at night when all is quiet. They are also victims of human projection, when we bestow human qualities upon them. When you paint you can't fail but jump into an enormous pool of art. So many people paint, and have painted over time that there is a gigantic back catalogue of art. To try to paint is to acknowledge who has painted before you. There is a custom at Art School that you try not to repeat what other people have done before you, nor repeat or mimic. I am now too old to still be trying to please my teachers but it is still a goal of mine to be original, and I am aware of many artists that I admire, such as Leonard McCoomb, David Salle, Michael Craig-martin, Andy Warhol, Eduardo Paolozzi, Claes Oldenberg, Edward Bawden, Henri Matisse, Mary Fedden, Mary Cassat, Gwen John and Winifred Nicholson. Where do we fit in today? Are we in post - process-based Minimalism, Post Modernism, Post Feminism, Post Colonialism, Post-crash Photoshop Abstraction? Does it matter? It's just a game. Does the technique you use in 2011 in N.E Essex, UK, require us to reference one of the most popular image editing computer softwares - photoshop? I use a digital camera for taking visual notes, and then try out colours, and compositions when planning a picture using this helpful programme, but I like to leave in traces to show that it is made by human hands and choose oil paint because it is a traditional and challeninging medium. Do we become classified by our intentions or our technique? Am I a painter or a Photographer? Or Neither? It is for you to decide. Flat space, with an all over pattern...that is how flowers and plants can work, as a textile pattern, or a decorative fabric. 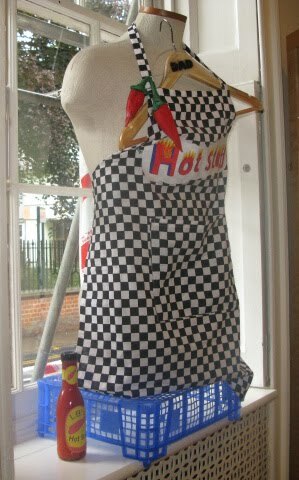 Take an object like a tea towel or curtain. A painting is an object, but they are objects with paintings on them. 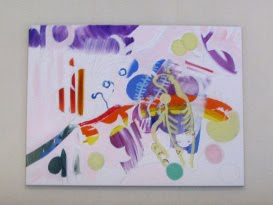 A painting provokes ideas or thoughts. So can any object. A paintings harnesses emotions and feelings. so can a photograph. A painting reflects our observation or can act like a kind of visual list with layers of images, one ontop of another or juxtaposed in a neutral kind of space. 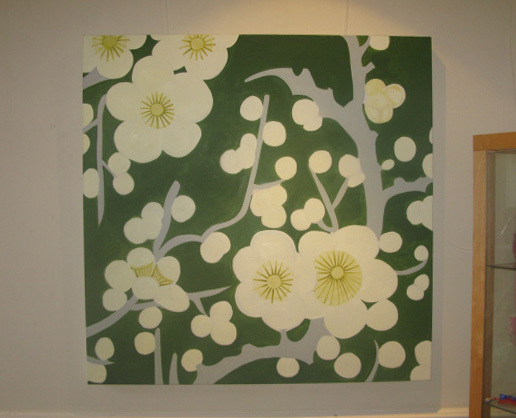 A painting is a document which carries the frail hopes of someone trying to entertain but also to learn. Painting as a process offers numerous opportunities for reflection as you go along. Filling in the blanks, painting inside previosuly drawn lines with colour or desperately fighting through chaos until a level of balance or truth is achieved. is in itself a pleasing and enjoyable thing to do. Manoeuvring ever more tightly in the tiny space left by the painters who've done it before us is almost fractal in its dimensions; just when you thought there was no more room, a vast ocean of possibilities opens up before you. Jane Ostler, June 2011 Level Best ArtCafe. 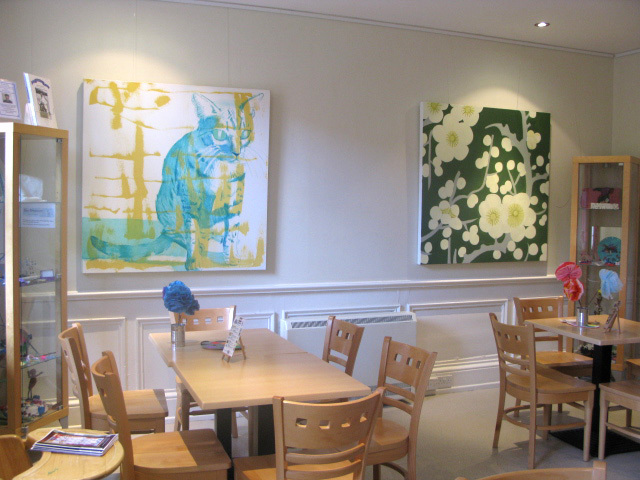 Jane's show runs from the 10th June - 8th July and you can view it monday - friday, 10 - 3:30. Report from our work experience placementee cont. When I got to work I was saying hello to all my work mates. a spatular and speading it on the cof'fee cake. Finally the coff'e cake was ready to sell and it did really well at selling. Art Cafe should it should go so that everyone can see it. dummy standing on a box. Then it was break time, I Was sitting with sarah and jane. parade of all the soldiers that fight in the war, which was nice to see. where we could see the newspaper still. student in the Art Cafe to know makaton and the staff don't know makton either. together doing the reading of how we make the cake and how much we put in. sugar, I had to have 8 ounces of sugar and then I put it in the bowl. After doing my bit it was Mark's go and he put butter and sugar and mixed it altogether. tomorrow" and they replied back "bye" and I left and went home with Mum. a spring roll with sweet and sour sauce, and rice. It was so tasty. the carrots into little pieces and I had a bowl and a whisk on the ingredients for the carrot cake. Kayligh added carrots in and I whisked it. shape. Sarah hnd another job for me and Kayleigh that was to put the chutney sauce in the jars. I thought it was good team work. had to go so it was me and david to do, so we did it with success. The last bit of the day was me and david was counting up the money for sarah. So it was one less job for her to do. My mum arrived to pick me up so I said bye and went home. Today when I got in the ArtCafe. I said hello to everyone. Jane introduced me to Ashley and Oliver. David and his carer. Then I had a bag and Sarah was picking lettuce and was putting it in the bag. Then it was tea break and me, sarah, Colin, Ashley, We all sat eating rich tea biscuits and having a drink. The next part I just sat and watched them and went back to the Art Cafe. When we all got back I was checking my log on the computer. At lunch I had vegetable Lasange. With salad, and wayne helpd me bring the food to the table. I met Nerisha, Tristan and Andrew and his lady called Oliver. After lunch me and Jane was colouring some flower picures and we couldn't stop but finally we did. on facebook by the phone, Andrew gave m his facebook name. I only met them today, the last bit of friday the day was me, Jane and Nerisha was putting labels on jars and that was my day and then mum took me home. getting to know her at breaktime. Then I got back to the Poster and was colouring it in neatly. It was lunch and I had jacket potato with cheese and salad. After lunch me and Jane went on the computer and copied my blog on the art cafe log. This is because i's to tell people what we do there. I aklso took a picture from he camera and Jane put it with my blog. Then we had a break and all hd rice crispy cake and all chatted to each other. The last bit of my day was to paint the pepper yellow down the bottom and today my mum and grandma came to pick me up and take me home. Today my mum brought me into work. 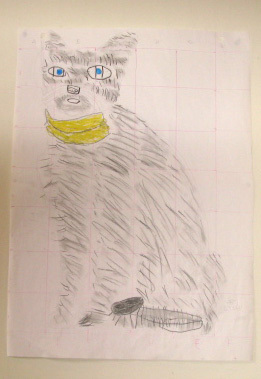 After that I was working with Jane and Mark, we was drawing Jane's cat that she copied. Jane put the picture into sections with a ruler and I did it also, it was hard, but then it became easier. and I was using crayon and smudging with my finger to give my cat an affect and to get people to buy my picture. 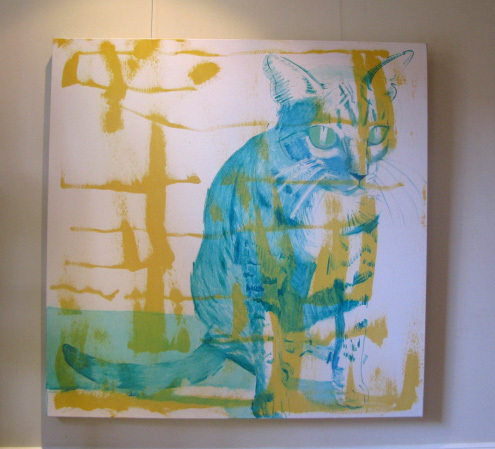 Then I was finished and I was so pleased with my cat picture and Jane put it in the art gallery. It was lunch and I had asparagus quiche with salad. I got a chance to speak to Bernadette. website ready to be sold. Then it was break, I was sitting with Jane, David, Simon, and Keriaki and was chatting away to each other. After break I did my border for my auction poster to finish it off. arrived to take me home, so I said bye to. all of the staff and work mates and they all replied bye to me and I left ready to go home. Day 1 of my work at the ArtCafe. Before I started I washed my hands and put an apron on. I did Art work with Jane and Trish who I met today. 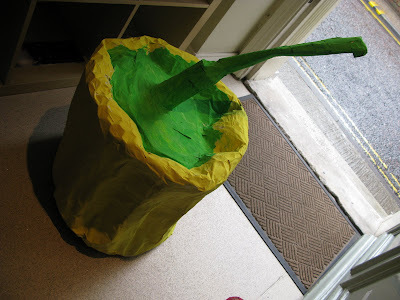 Then I put cold water in the bowl ready for paper macheing,I was gluing and pasting for making a big pepper out of paper mache. Jane got a roll from the wrapping paper roll. I used a rubber hammer because the cardboard roll was hard. Then after doing the paper mache it was break. I was chatting to Jane, Simon and Scott, they were lovely. After break we went back to work. Me and Jane was looking for a pepper on the computer while Trish was looking. Then I stuck the the roll for the pepper stem then I bent it to make the shape. It was lunch and I had a jacket potato with cheese and beans and salad. It was nice, I was sitting with Jane for lunch. Then it was time to work again. This time I was cooking with Sarah and we was making Coffee cakes. I was weighing out the butter using scales and I was weighing it out in ounces. Then I put the butter in the bowl and then stirred it till it melted. Then I cracked three eggs into the bowl and then put sugar in and stirred it altogether in the bowl. Then Sarah put the cake mix in a round baking tray and put them in the oven. Then I was putting the cakes that were all ready made, I put them in separate tins and Sarah put them in the fridge and I also put the breads in a plastic bag. I washed the tables, plates, the sink and then washed my hands. The last bit I had to do was drying the flower pots for Sarah. Before I knew it, it was time to go home and my Mum picked me up with my Grandad. Grandad went back to his house and my Mum and me went back to our house.